We had a direct flight from Kuala Lumpur to Danang, which was very convenient. 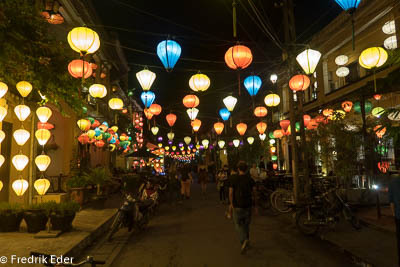 We took a taxi from the airport to our homestay in Hoi An. We recognized a lot on the way, from our last visit in 2013, but there was a lot of resorts being built along the beach between Danang and Hoi An, so the area is constantly changing. 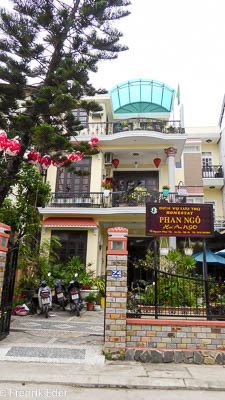 Ngo homestay was very central and cozy, but in a quiet street a few blocks away from the chaos of the old town. Every morning we had a great local breakfast (ordered from a nearby restaurant), often some sort of noodle soup. 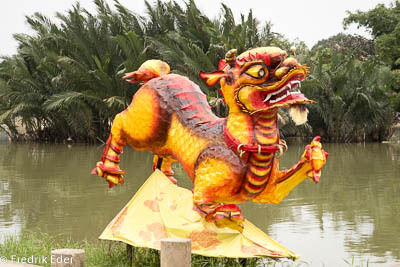 The city was getting ready for Vietnamese New Year (Tết), and there were lanterns and lights everywhere, and large dragon sculptures in the river. Large pots with yellow flowers were constantly being transported back and forth (mainly on the back of motorbikes), to get tiny red ribbons hand tied to each flowers. 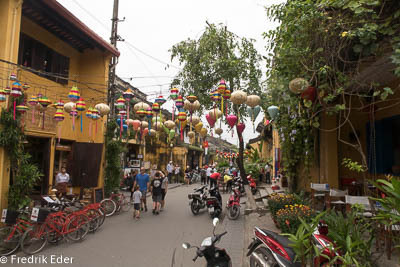 Hoi An had changed a lot since the last time we were here. You actually needed a ticket to get into the old town now, and there were a lot more tourists and big groups. Also a lot of the cozy local restaurants had been replaced by chain restaurants and coffee shops. Everything was more expensive than normal because of the holidays. Most tailors were closing down for 10 days, so we stressed a bit to pick one, and got all our clothes made in just over 24 hours. Not sure that was a very good choice, because we didn’t really have time to look around, and find the best fabric for what we wanted, but it seemed to be the best option at the time. We found a restaurant called Mango Mango close to the hotel that served craft beer from Pasteur brewery in Saigon. We also spent quite a bit of time at the dive bar, Cham Island Divers. No diving was done in another month or so, but it was still a great place to hang out. People played pool and board games, and the waitress came around with free shots several times during the evening. We talked to several different people about diving, travelling and tailors. We also went to an Australian Bar (3 Dragons Sports Bar & Restaurant) a bit outside of the center, because we saw they had a local craft beer we hadn’t tasted. We talked a lot to a Swiss bartender and a Finish couple there. We ended up joining a pub quiz, but were not very good at it, especially since it had a lot of questions about Australian and Vietnamese celebrities etc. We had great burgers and played a few rounds of pool. We also stopped by the next day, since it was Australia day, but when we arrived at 7 pm, most people had gone home drunk already. One day we rented bikes from the homestay and bicycled to the beach (approximately 6 km one way). When we arrived there lots of people wanted money for bike parking, and it all seemed pretty chaotic. We went along the beach a bit instead, away from the hustle and bustle. 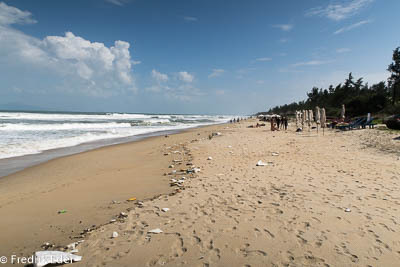 There was very much trash on the beach, and the locals didn’t seem to care much. We had a not so good glass of white wine in a very local restaurant (probably the bottle had been open for too long), and decided to head back. We stopped at a bridge to take photos on the way, and spotted a nice place called Biaaa! & Bbq a bit hidden along the river. We went back for a beer, and ended up staying for hours, eating some small dishes, talking to the owners, enjoying the sun and having a great time. We took a different route back to the hotel, stopping to see some communist buildings, statues and nice parks, and a lot of Tết-decorations everywhere. 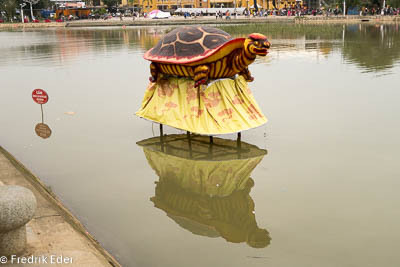 Since we had been in Hoi An before, we had seen all the main sights. Instead we decided to walk around in some of the smaller streets with less tourists. We found a large market and a lot of small restaurants with so much amazing food. We also went back to “Morning Glory”, one of the best restaurants we visited the last time we were here. 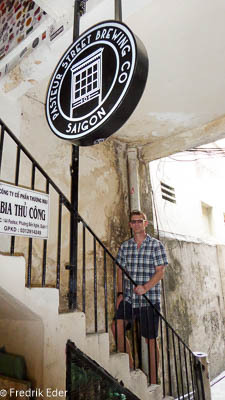 Our last destination was Ho Chi Minh City, where we stayed at E Central, a slightly upscale place in the backpacker street. We didn’t recognize the street at all, but a few other places around town were still familiar. We found a great small restaurant called the Chicken Coop, that had their own craft beers. We had some great food and beer there, and also talked to a lot of people, since they had these long tables which made it very social. We went to see the flower street, some drum shows and light shows, street acrobats etc. We stopped by the Official new year celebration, but did not get a lot out of it. Later in the evening we visited Heart of Darkness brewery and tasted the beers they had on tap. They were ok, but we were not very impressed, and there were hardly any people there either. We also stopped by Pasteur brewing on the way back, but they were closing, so we had to come back the next day. 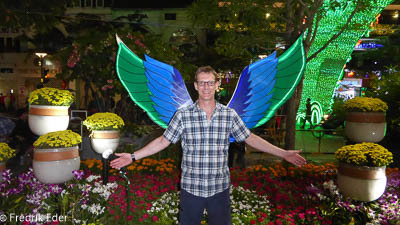 Our flight back to Norway were not until 2355, so we had another full day in HCMC. We had several breweries and craft beer bars on our list, but all of them except one was closed on this day (Vietnamese New year’s day). So we went to Pasteur Street Brewing, luckily the highest rated one, and tasted what they had to offer. Quite American with a lot of hops, but they also had some really good ones. Other than that we spent the day doing some last minute shopping and eating some of our favourite Vietnamese dishes. It was a long travel home via Dubai, but we arrived home on time. Gunnhild’s 29 kg suitcase had a rough trip, and only had one wheel left when it arrived in Norway. Quite a hassle, but at least it was quick to register the damage, and Emirates will cover the repairs. We were worried it would be very cold when we got back, but it was only a few degrees below zero, and a little bit of snow on the ground. Not too bad.